Frequently, and in multiple ways (email, phone, set up meetings in person). If they claim to be Christians remind them that they are to love their neighbors as themselves (including the littlest and least of their neighbors), establish justice for the fatherless (Isaiah 1:16-17; Amos 5), and be men and women of action and not just words (James 4:17). Tell your legislator that it’s not enough to claim the name of Pro-Life any m0re. That they must move beyond the possession of a moral opinion and take action.Let them know that they will not be able to remain in office as “pro-lifers,” but that they need to become Abolitionists and Support SB13. You can easily find your legislators here. Just type in your address and you will get their name and all the info you need. We are asking all Oklahomans to start with contacting Senate leader Greg Treat, President Pro Tem of the Senate. Greg Treat has the authority to bring SB13 to a vote on the Senate floor or kill it by assigning it to a committee and instructing them not to pass it to the floor behind closed doors. Read more about the need to contact Treat in our our current Urgent Action Report. 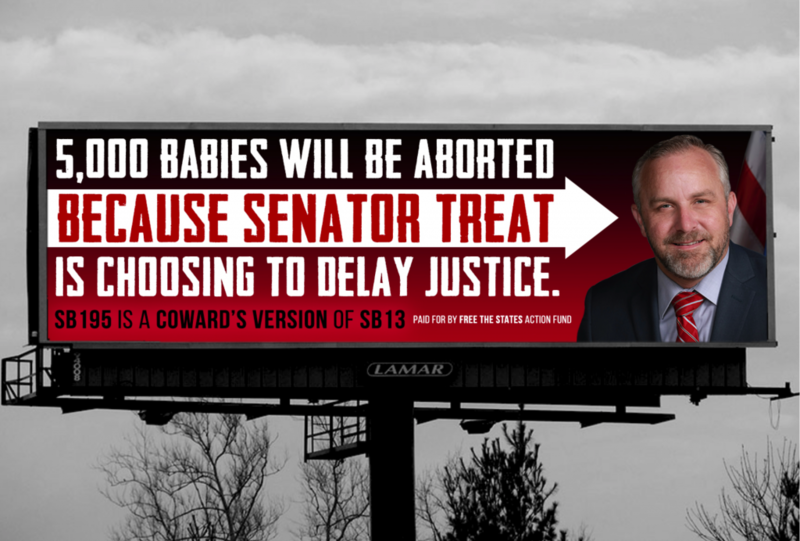 Sen Treat has continued to deceive the people of Oklahoma about what he is currently doing to prevent the abolition of abortion in our state. Though he claims to be an “anti-abortion” conservative evangelical Christian who got into politics in order to fight abortion, right now, Sen. Treat is the primary person keeping abortion from being abolished in Oklahoma. 5,000 babies will be butchered in Oklahoma because he has chosen to delay justice and deny SB13. Senator Jason Smalley is still stalling while he has the right and power to move SB13 along in committee. He wants Oklahomans to believe that he is “out of time” to hear the bill, while he actually has until Feb 28th to allow it to be heard and passed in committee. It is time to put this lie to rest and call Senator Smalley to the carpet for his attempts to kill the bill. Sen. Smalley and Sen. Treat are also spreading a number of myths about SB13 in order to justify their rejection of abolition. Watch our video answering their objections and obfuscations. 4. Sign the Pledge to Support SB13 on our Home Page. We are mobilizing supporters every day. We need to be able to contact you. 3. Spread the word about SB13 everywhere, and in every way you can. -Bring up SB13 at Work around the Water cooler, at Family Gatherings, on social media, by email, by phone. Talk to people of influence. 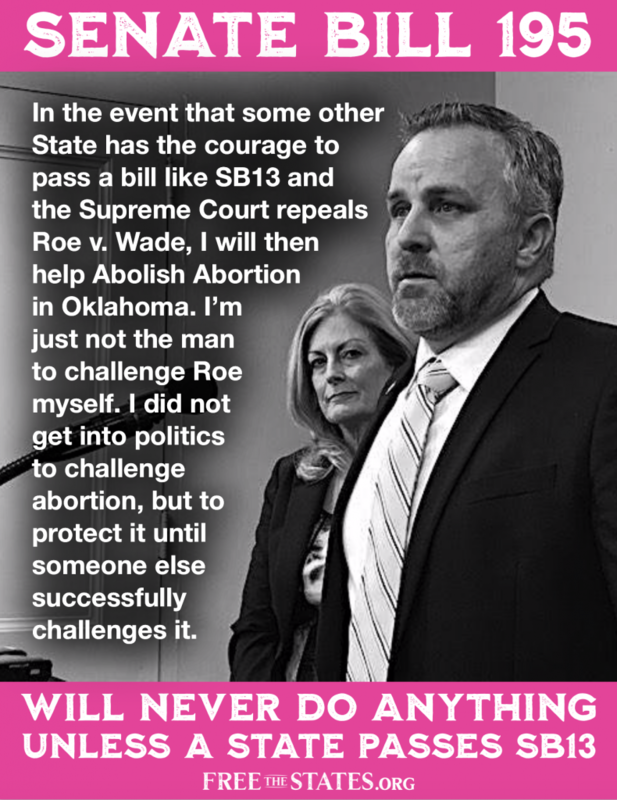 Convince them to use their influence to help Abolish Abortion in Oklahoma. This is a grassroots movement depending on passionate people and their word of mouth. -Talk to your Sunday school Class, Book Club, or any other gathering you attend. 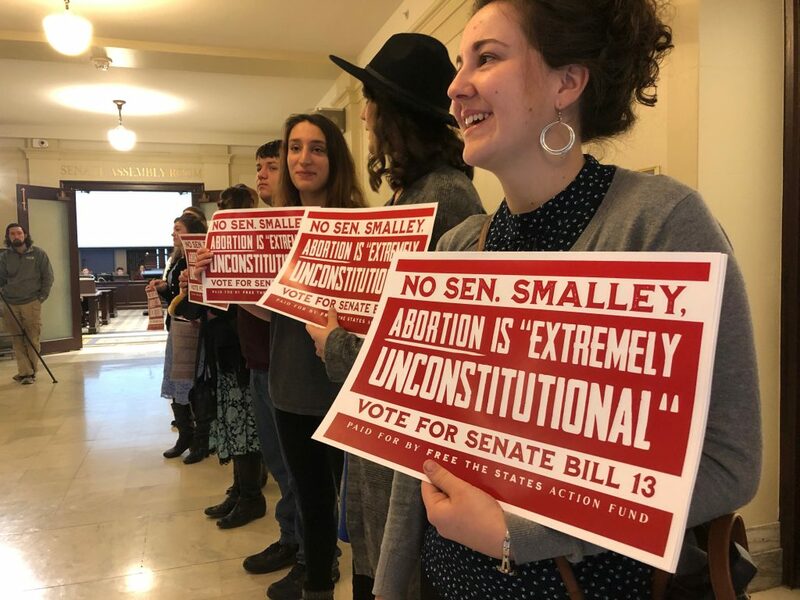 A bill calling for the total and immediate abolition of abortion as murder has been filed in the Oklahoman Senate (author Sen. Joseph Silk) and your support and engagement is important to insure that it is voted on and passed. 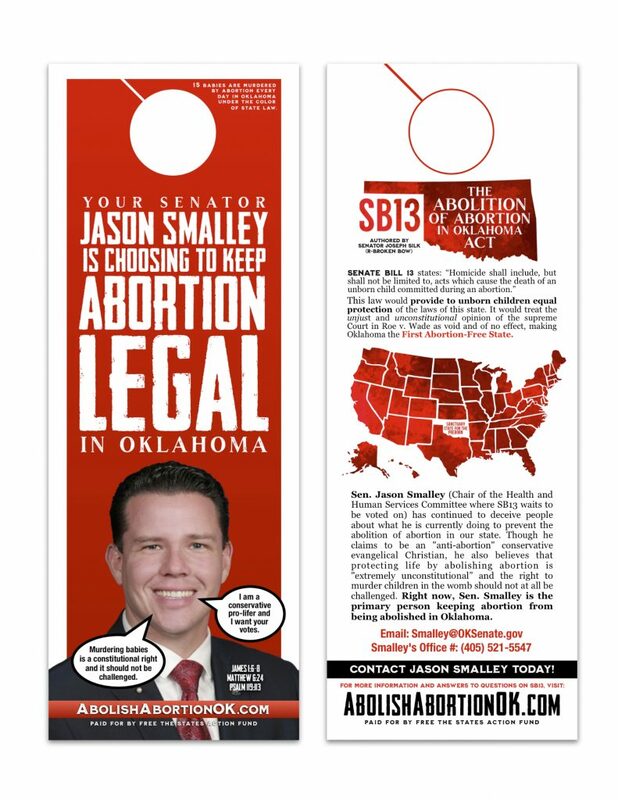 Check out the Website: AbolishAbortionOK.com too read the bill and learn more about what you can do to help save lives in Oklahoma and further the cause of abolition across the states! PS: There is a big rally to support Senate Bill 13 on February 12th at the Oklahoma State Capitol. You need to be there in the flesh to show the Senate that Oklahoman’s are serious about ending abortion now! The Rally starts at 10am and it is open to all. Please come and bring your, family, friends, and any one else you know willing to stand up for justice and mercy. If you are on Facebook, you can RSVP for the Rally here. 4. HELP US promote this site to every Oklahoman. Donate Now to the Free The States Action fund. Join Free The States! 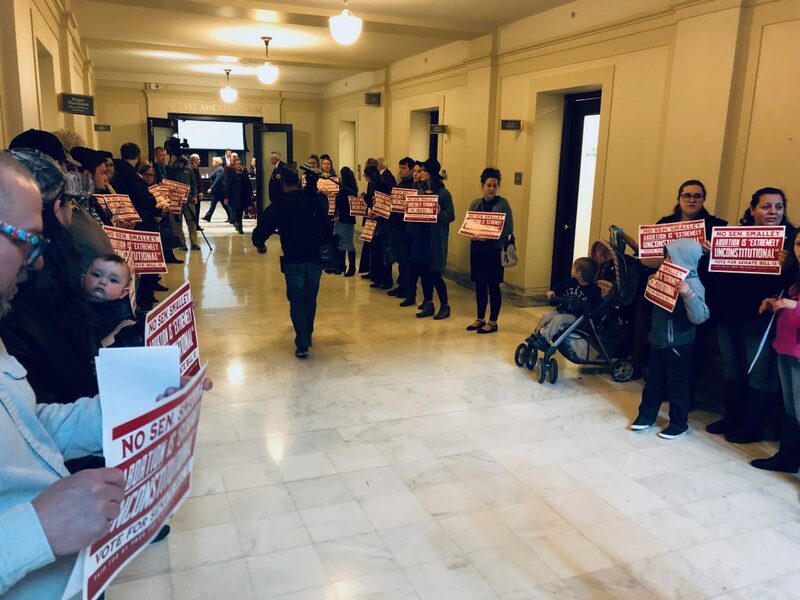 Free the States is organizing the lobbying effort to ensure is heard by the Oklahoma legislature and makes it to the Governor’s desk to be signed. We are relying on donations from everyday people to help us carry the financial costs of this campaign. PLEASE make a donation of any amount right now to help us promote SB13 to every living soul in Oklahoma.